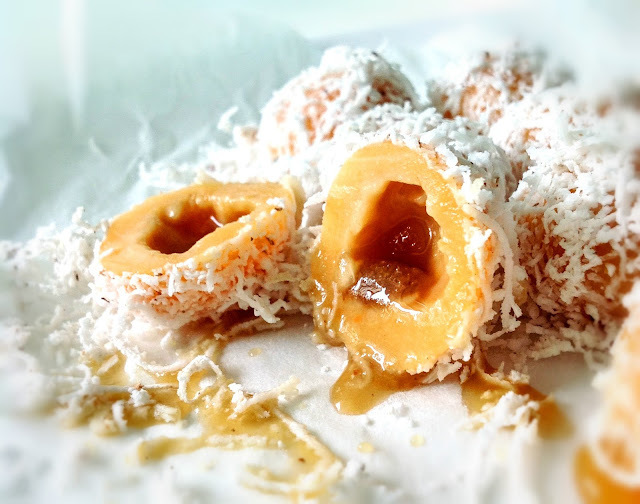 I love Ondeh-Ondeh (or onde-onde), a Malaysian dessert dumpling made of sweet potato and glutinous rice flour, wrapped with gula Melaka (palm sugar). Yes it can be found everywhere in this country, cheaply; but there's probably very little sweet potato used in them, just loads of flour. Although it will take a lot of work and time, I've convinced myself to make it just for the sake of it. Can't remember when was the last time I made Ondeh-Ondeh but I do remember that I was helping my auntie and it tasted really good. 1. Cut the sweet potatoes into small chunks and cook them with boiling water in a pan for about 10 minutes. The chunks should be softened by now. 2. Drain the water and mash the sweet potato with a masher, then add in the glutinous rice flour and mix well. The mixture should look a little like crumbly mix for short crust pastry. 3. Slowly add in the water, little by little, to bind the mixture and knead into a dough. The amount of water used should be just enough to do so. 4. Take a small piece of the dough, roughly make it into a round disc and place a little palm sugar into the middle, then wrap it up and roll into a ball shape. Repeat this till the dough is finished. 6. Now fill half a deep saucepan with water and bring to a boil. Whilst waiting for the water to boil, have the grated coconut ready in a large bowl. 7. Place the balls into the boiling water one by one, slowly. 8. When the balls start floating to the surface, they are done. Scoop the floating ones out with a slotted spoon or a net ladle. 9. Transfer the balls into the grated coconut, roll them around so that each one is well coated with the coconut. These are best chilled in the fridge before serving to keep the coconut fresh, as coconut tends to go off quite quickly. Taste much better when eaten chilled, in my humble little opinion. The ones we can find in the shops are usually green in colour, due to the screw pine leaves used as colouring and flavouring. Since I've got some orange coloured sweet potatoes I thought I'd just keep the original colour - no colouring added! 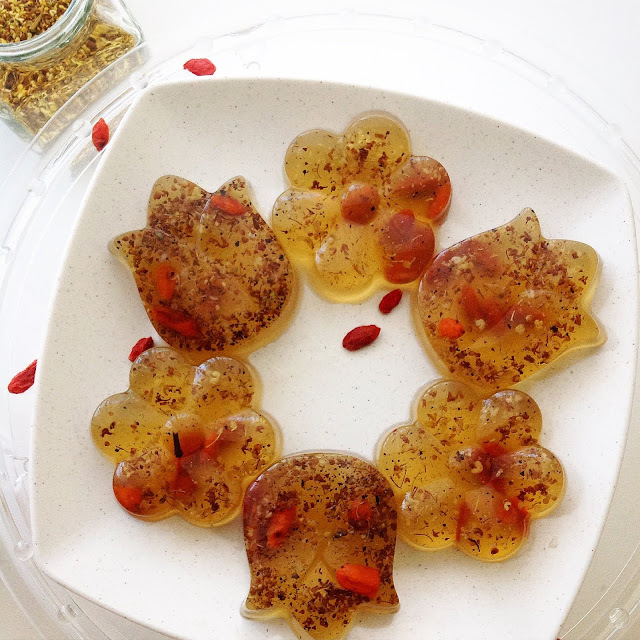 If anyone is wondering, glutinous rice has NO GLUTEN in it so this sweet little dessert is absolutely gluten free. There's bound to be some extra grated coconut left from the coating process, but don't throw them away just yet, I use it in cooking curry 😋. Also, I only poured about 1/3 from the bag of grated coconut I bought so what's remained untouched, I toasted it so that it can be stored for future use. And yes again, it's a lot of work and I'm really tired, but it's rather worth the hard work. Previously made and posted on 13/8/2017. This is how I used the frozen dough, just throw them in the boiling water. This time round, it only took me about 20 minutes, and I've used some of the toasted grated coconut I made from the last time.